This short, easy hike in the Umpqua National Forest leads to a beautiful view of Warm Springs Falls. It's the perfect addition to a day or weekend trip with close proximity to Lemolo Falls, Lemolo Lake and other trails. Warm Springs creek flows over the 70-foot columnar basalt cliffs to provide this dramatic fall anytime of year. The viewing platform makes for an easy spot to enjoy the falls and relax in the old-growth forest. Springtime, when the rhododendrons are in bloom, would be an ideal time to visit. A small side trail follows the canyon edge to give a different view of the falls, but explore with caution since there's no railing and the trail is not maintained. There is no trail to the base of the falls. 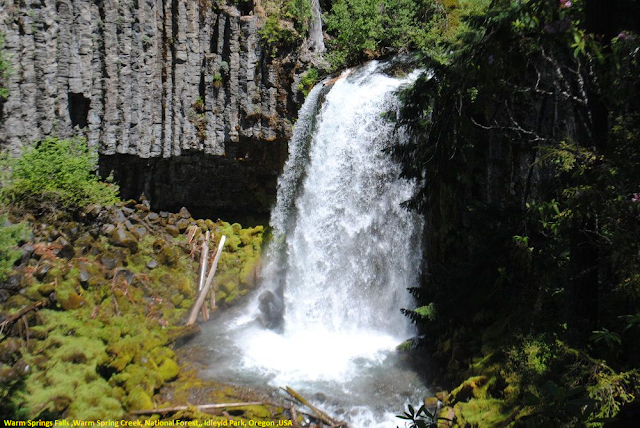 Warm Springs Falls is located near Lemolo and Diamond Lakes in the Umpqua National Forest. Depart Highway 138 eleven miles east of Toketee at FR 2610, marked for Lemolo Lake. Follow Road 2610 for 5.2 miles, crossing the Lemolo Dam along the way, and turn left on Road 600. Drive for 3 miles to Road 680 and turn left. Proceed down this route for 1.7 miles to the Warm Springs Falls Trail #1499. With the redevelopment in 2007.The trail leads to the viewpoint in 1/3 mile.